Recently gracing New York Magazine’s Cheap Eat list, A-Wah is located deep in Chinatown, nestled among dim sum joints and dry foods stores. Last week, I paid a visit to this hole-in-the-wall; I started with an old favorite – dan dan mein (noodles). 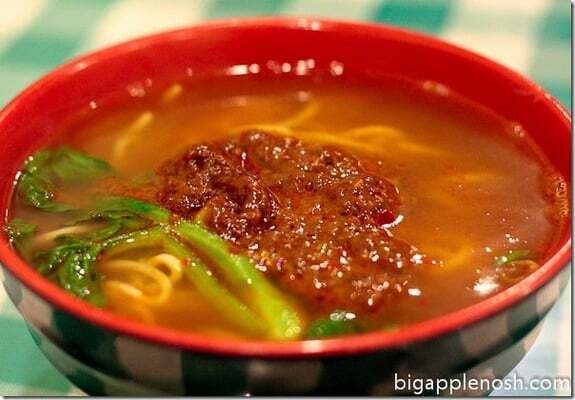 Originating from Sichuan cuisine, dan dan mein features chewy egg noodles and minced pork in a spicy/sweet chili oil broth. Every restaurant has a slightly different take on the dish, so I love trying it whenever I see it on the menu. A Wah’s version was a good mix of textures (the springy noodles with the crisp vegetables) and flavors (sweet, savory and slightly oily). At $4.50 for a bowl, I’d recommend. …and dug right in. I’m actually not the biggest fan of bo zai fan, but eating buddy enjoyed it – for $6.25 for a large bowl, it’s a pretty good deal. The ambience at A Wah doesn’t get much fancier than the green-and-white checkered vinyl tablecloth, and a few flat screen tv’s showing Asian pop stars. However, for the price, it can’t be beat. If you’re in the area, give it a try. 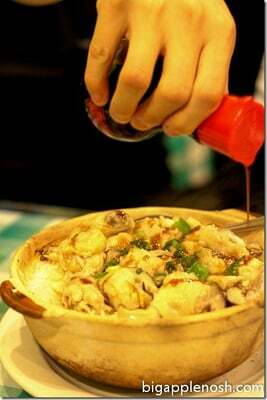 Good and cheap for dan dan mein and clay pot rice. noodles. oh noodles. i love thee. Were they just in NYT for their bo zai fan? Looks good anyway — I love getting bo zai fan in the winter on the street in Hong Kong. Next time I come to NY, I am definitely going to call you for a foodie tour!! Thanks! I am always looking for authentic Chinese food. 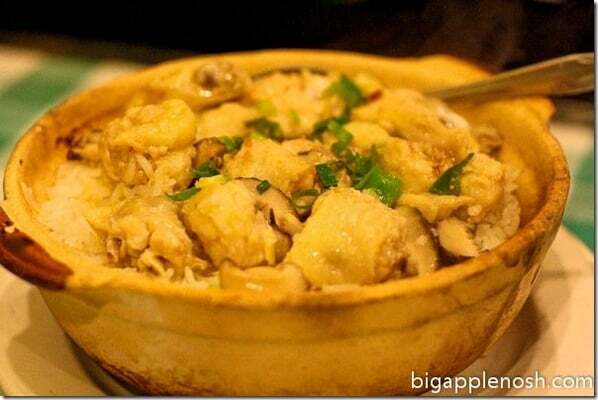 Yum, i love clay pot rice! I always want to hop on a plane to NYC when I read your blog and this is no exception. I want noodles…now! is this the one in the tunnel?